Platform games are those in which gameplay consists of jumping, climbing, (and, too often) falling from platforms that hover mysteriously between the playerâ€™s avatar and the goal. Probably the most popular platform games are either Donkey Kong (Nintendo, 1981) or one of Nintendo's near-ubiquitous Mario Bros. games. These are, of course, legendary games and worthy of considerable study, but I would like to focus my attention on four lesser-known platform games that were widely available for the Commodore 64 (C-64) computer: Epyxâ€™s Jumpman (1983), Synapse Softwareâ€™s Pharaohâ€™s Curse (1983), Broderbundâ€™s Spelunker (1984), and Electronic Artsâ€™ Ultimate Wizard (1986)1. All of these games offer unique features that dramatically affect the gameplay. In the last issue of Armchair Arcade, I discussed Nintendo's Metroid and Rainbow Arts' Turrican and how these games differed in terms of complexity. In this article, I will be revisiting that theme, but this time showing how increased complexity does not always allow for a more involving and replayable game. I pity the poor child of a C-64 family who was deprived of Epyxâ€™s Jumpman, which must surely rank in the top ten classic games for that hallowed system2. The object of Jumpman is simple: Collect the bombs and advance to the next level. This is only possible, of course, with a great deal of harrowing leaping from the edge of one platform to the next, all the while dodging a small white bullet that slowly scrolls horizontally or vertically across the screen and â€œshootsâ€ speedily towards the avatar if he crosses its path. There are also more significant obstacles: Occasionally, a part of a platform will disappear if Jumpman seizes a bomb, so strategy is required to collect the bombs in the proper order. Later levels involve a plethora of creative and increasingly difficult challenges: Robots, vampires, fires, moving ladders, and aliens just to name a few. Only masterful players will see these levels, of course, since the first beginner level, â€œEasy Does It,â€ is difficult enough to stump many would-be jumpmen at the gate. There are so many wonderful things we could discuss about Jumpman. The game has a quirky, sarcastic humor that is sure to make even the grimmest player chuckle occasionally. When the avatar dies, for instance, he drops from platform to platform in a painful, cartoonish fall. When he finally lands at the bottom, small stars circle his head as Chopinâ€™s Funeral March plays in all its SID-chip glory. The great part of this fall is that Jumpman collects any bombs he happens to contact on his way to the bottom! As one can observe in the screenshot here, Jumpman's graphics were minimalistic. While this fact may turn off some players, those of us in the know realize that such graphics allow players to focus on what is truly the essence of a videogame, namely, the gameplayâ€”and gameplay is truly Jumpmanâ€™s triumph. With all of Jumpmanâ€™s bells and whistles, itâ€™s hard to imagine a game that could somehow offer more. Broderbundâ€™s Spelunker, released a year later, does seem, however, to go a step beyond. I will not argue here that Spelunker is a better game, but it does offer some substantial improvements. Probably the biggest improvement is that while Jumpmanâ€™s action takes place all on one screen, Spelunker features a coherent â€œgame worldâ€ composed of many levels. The avatar rides an elevator up and down a considerably deep mining shaft in his quest to recover some priceless treasure located at the very bottom3. For many players, this gameworld is quite absorbing; I hear reports that some players even become claustrophobic or nauseated as they progress ever deeper into the cave. The quirky humor present in Jumpman is not present in Spelunker. The introductory music is slow, melodic, and somber. When the game begins, new players are lucky to last more than a few seconds, as even the tiniest error in jumping judgment will destroy the avatar. As one site puts it, â€œThe main character is a little more fragile than a six-year old with hemophilia and bones made of paper mache.â€ This is a game that requires intense precision, concentration, and a Buddhaâ€™s patience. In short, this game is insanely difficult. As if pixel-perilous jumps and landings werenâ€™t difficult enough, Broderbund threw in a time limit shorter than a boy can hold his breath, a ghost that flutters in periodically to visit death upon the player, bats who drop deadly guano on his head, and, finally, sticks of dynamite. The dynamite is supposed to help the spelunker past rocks and other obstacles, but if he doesnâ€™t get far enough away from the blastâ€”death. That said, why would anyone want to play that pinnacle of gaming frustration known as Spelunker? One likely reason from a gameplay point of view is the spelunkerâ€™s equipment. Unlike Jumpman, who could only pick up bombs, the spelunker can retrieve dynamite and flares which are handily lying about the cave. The flares are used to ward off the guano-dropping bats, and the dynamite is necessary in a number of tight locations. The spelunker is also equipped with a blower-like device to ward off the ghost, but the player must time this process to the second. Only the most strategic of players will advance very far in Spelunker; sweaty palms and much swearing are inevitable. Perhaps a more compelling reason is simple curiosity. What is at the bottom of this damnable shaft? There is definitely no easy way to find outâ€”I have yet to meet a player who has beaten this game. One thing is for certain, though, it must be utterly fantastic to merit this much danger! The third game I will be discussing today is Electronic Artsâ€™ Ultimate Wizard. This game, published three years after Jumpman, returns to the same-screen action of its predecessor and blatantly copies most of the graphics and gameplay. The first time I saw this game, I swore it was a sequel to Jumpman. Even the famous Jumpman death scene is duplicated here! Players with a preference for originality and a hostility towards â€œborrowingâ€ may wish to forget this title, but, all such prejudices aside, Ultimate Wizard remains a great game and further extends the Jumpman theme. One of the most memorable spells available to the wizard is "Invisibility," which allows him to slip past one of the rather intelligent monsters which chase after him in the maze. Another is "Disintegration," which casts a magic missile towards an enemy. "Feather Fall" allows the avatar to fall gently from a distanceâ€”a feature sorely missed in Jumpman. The spells add a distinctly strategic element to the game that, for many players (including Shane R. Monroe of Retrogaming Radio) makes this title a dramatic improvement over its predecessor. While I agree that Ultimate Wizard is a fine game and worthy of respect, given a choice, I would remain faithful to Jumpman, if for no other reason thanâ€”letâ€™s face it, Electronic Arts seems to have plagiarized most of this game, and itâ€™s also nearly as hard as Spelunker. I have saved my favorite early platform game, The Pharaoh's Curse for last. Most people I have met who have played this game on the C-64 remember it well enough to still know the password to the second level. The music, sound effects, and graphics are all top notch for 1983, but the gameplay is what really makes Pharaohâ€™s Curse a must-have. Like Spelunker, Pharaohâ€™s Curse extends across several screens. Unlike Spelunker, though, the gameworld is not coherent. What I mean by this is that the levels consist of a number of screens which can only be displayed one at a time. Therefore, the avatar exists left, right, or down, and finds himself on a new screen each time. There is no â€œin betweenâ€ like Spelunker, but we still have more fluidity here than in Jumpman or Ultimate Wizard. The goal of Pharaohâ€™s Curse is similar to Jumpman: Collect all the treasures on each level. Of course, these treasures are not easily accessible; some require careful jumping, others a heart-quickening dash through deadly mashers, and some keys that must be dragged from other rooms. The avatar usually needs some help from a lift to get to a platform; however, these lifts are booby-trapped and only careful timing ensures a safe ascent. To make life even more difficult, a gun-wielding warrior and mummy randomly appear and chase down the explorer. Itâ€™s probably best not to question how ancient mummies acquire firearms, but itâ€™s a nice trade-off for unlimited ammunition in the avatarâ€™s pistol. Another, less-deadly but much more annoying enemy is the hawk, which occasionally swoops down on the avatar, picks him up, and randomly deposits him on another level. The bird seems to enjoy doing this the second before the avatar seizes a hard-to-reach treasure. The flight is also enough to jostle the key out of the avatarâ€™s hand, which makes reaching the locked treasures a very challenging task. Death comes often and easy in Pharaohâ€™s Curse, but since the player receives an extra life every time he or she retrieves a treasure, dying isnâ€™t quite as frustrating as in the other games. What is so great about Pharaohâ€™s Curse? For one, the gameplay is much smoother and consistent than in the other games. Here, pixel-perfect jumping is not required; the avatar can scramble a bit if he misses a ledge, and he can fall from any height without injury. These facts relieve the player of a great deal of frustration and make the game much more playable. Most of the challenge of this game consists of timing and quick reflexes; avoiding the hawk and shooting the mummy and warrior call for a highly active and alert player. Unlike Spelunker and Ultimate Wizard, there are no special items the avatar can retrieve for new abilities â€” save the keys - which are only used in two or three locations. What we have in these four games are examples of the same basic game with varying levels of complexity. 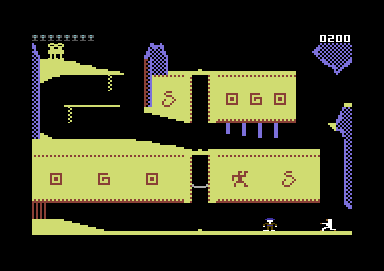 Jumpman and Pharaohâ€™s Curse are the most straightforward; once the player masters the art of jumping, climbing, and (in one case) shooting, the rest of the game consists of mastering individual levels. Ultimate Wizard and Spelunker add a dynamic layer of complexity to the mix, and require players to master not only basic controls but find strategic uses for new equipment and abilities. Ultimate Wizard probably ends up being the most complexâ€”a fact which likely accounts for its relative obscurity versus the other titles described herein. I will wrap this article up with some advice for game makers, but also with a confession that issues of complexity and difficulty are not likely to be easily resolved. Some players prefer very difficult and complex games like Ultimate Wizard, while others appreciate a lower learning curve. Fortunately, I have the luxury of possessing several friends who were not familiar with any of the games discussed in this article, so I invited them to try each. Without fail, they were most captivated by Pharaohâ€™s Curse, and I worried for awhile if I would be able to remove them from the computer long enough for me to finish this article. Would Pharaohâ€™s Curse have been a better game if the programmer had added â€œpower-upsâ€ and extra abilities? I can easily imagine a power-up giving the avatar a more powerful weapon, or requiring him to find tools (like dynamite or a pick) to access certain parts of levels. He could have learned to cast spells like the Ultimate Wizard. For some reason, though, such additions seem more superfluous than intriguing. Obviously, there is a very fine art to power-up based complexityâ€”Metroid is one of the few titles that has succeeded most admirably. One fact is for certain: Game makers must ensure that their games are not so difficult or complex as to turn away potential players at the gate, which is why I feel Ultimate Wizard and Spelunker are less popular among new players than Jumpman or Pharaohâ€™s Curse. 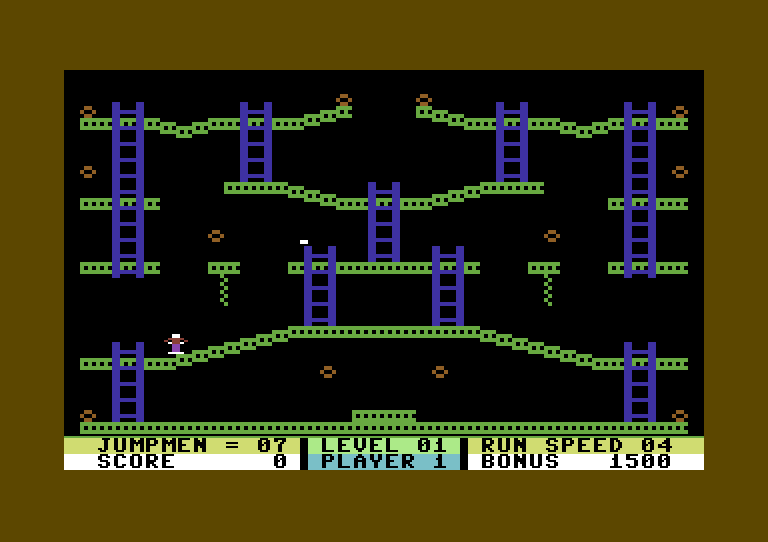 Broderbund is also responsible for the groundbreaking platform game Lode Runner. Pun intended. Jumpman was created by Randy Glover for the Atari 800 (8-bit computer line) first, then ported to the C-64. You can read much more about this wonderful game at the Epyx Shrine, a site I recommend very highly. This mission, of course, is not obvious to those players who received this game without the accompanying print documentation.